The Department of EU International Relations and Diplomacy Studies at the College of Europe held the fifth annual "EU Diplomacy Lectures" in Bruges on Tuesday, 23 October 2018, followed by a short Q&A session and a reception. "The EU’s Arctic Diplomacy: Key Challenges and Strategic Response"
This EU Diplomacy Lecture addressed why and how the European Union is strongly engaged in the Arctic. It explained the key challenges of the Arctic region, including the geo-economic and geopolitical implications of major transformations in the Arctic, and the main elements of the EU’s Arctic policy. ​ ​Marie-Anne CONINSX is since September 2017 the European Union’s first Ambassador at Large for the Arctic. She previously was the EU Ambassador to Canada (2013-2017), after serving four years as the EU Ambassador to Mexico (2009-2013). In Canada, she extensively visited the Canadian Arctic. Her other postings abroad include having served as the number two at the EU Delegations in New York and in Geneva, which provided her with an extensive experience on multilateral issues. Ambassador CONINSX has been an official of the European Union since 1984. 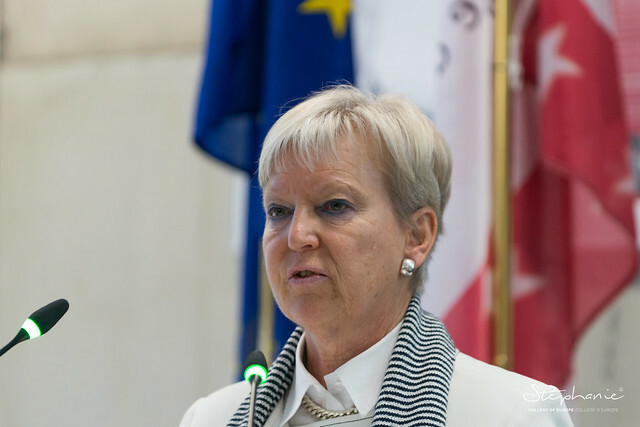 She started her career in the European Commission at the Legal Service, and worked during 12 consecutive years as a staff member at Cabinets of three Commissioners, dealing respectively with: External Relations and Trade, Internal Market, Development Policy, and relations with the European Parliament. She also worked at the External Relations Department at EU headquarters, overseeing relations between the EU and Latin America. Ambassador CONINSX studied law at Gent University and carried out post-graduate studies at Cambridge University and at the European University Centre in Nancy.